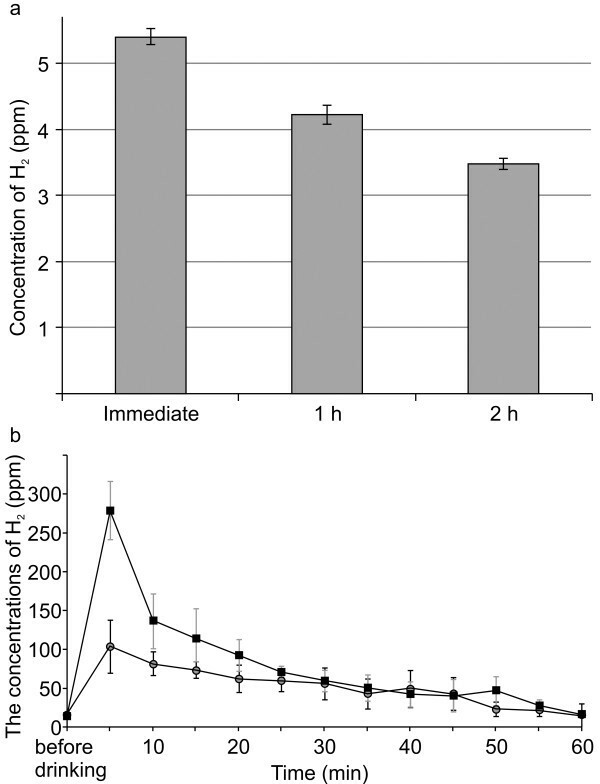 Drinking high H2 water seems to raise the concentration of H2 more than the H2 saturated (1.6 ppm) water in vivo. 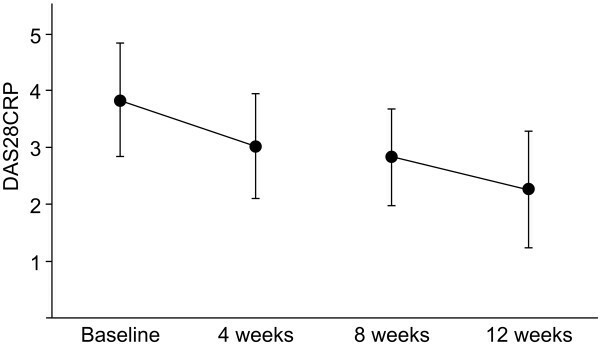 Urinary 8-OHdG was significantly reduced by 14.3% (p < 0.01) on average. DAS28 also decreased from 3.83 to 3.02 (p < 0.01) during the same period. After the wash-out period, both the urinary 8-OHdG and the mean DAS28 decreased, compared to the end of the drinking period. During the second drinking period, the mean DAS28 was reduced from 2.83 to 2.26 (p < 0.01). Urinary 8-OHdG was not further reduced but remained below the baseline value. All the 5 patients with early RA (duration < 12 months) who did not show antibodies against cyclic citrullinated peptides (ACPAs) achieved remission, and 4 of them became symptom-free at the end of the study. Apart from the present immunogenic targets, reactive oxygen species (ROS) are of considerable interest. ROS is spontaneously produced as by-product during electron transfer in oxidative phosphorylation [3, 4]. They are also actively produced by NADPH oxidase, which play important roles in the immune system [5, 6]. ROS include superoxide, peroxide, hydroxyl radicals and reactive nitrogen species. They oxidize various cellular and extracellular components, including nucleotides, DNA, proteins, polysaccharides, and lipids, by the unpaired free radicals. The numerous products that appear to be generated by ROS have been identified in clinical samples including peripheral blood and fluid from the joints in patients with RA [7–9]. Among them, 8-hydroxyguanine (8-OHdG), which is produced by the oxidation of guanine bases in DNA and also in the nucleotide pools, is important [10–12]. 8-OHdG is a standard biomarker for oxidative stress. Numerous studies have reported that 8-OHdG accumulates in diseases related to oxidative stress, such as cancer, diabetes mellitus, Alzheimer’s disease, hypertension, chronic renal disease, cardiovascular disease, metabolic syndrome and autoimmune disease [13–18]. Elevated levels of 8-OHdG have been reported in RA . Hydroxyl radical is the most toxic ROS due to the detrimental effects of its rapid and indiscriminate reactivity. Is has been shown that molecular hydrogen (H2) eliminates the hydroxyl radical in cultured cells and living organisms [19, 20]. H2 does not have any influence on the other ROS, including superoxide, peroxide, and nitric oxide; these ROS play important roles in the defence system or in signal transduction . In humans, the safety of H2 has been tested, especially in the field of deep diving; in contrast to general drugs, which usually have some harmful effects, no cytotoxicity was found even at high concentrations of H2[21, 22]. H2 is an inert gas present within the human body and is not classified as a medicine, but it has been shown to have therapeutic potential for acute or chronic inflammatory diseases related to ROS [20, 23]. H2 dissolved in water has already been used in the clinical treatment of type II diabetes mellitus  and metabolic syndrome . At present, there is no evidence that H2 provides benefits for patients with RA. We might expect H2 to complement or provide a substitute for conventional therapy by reducing oxidative stress in RA, especially where existing drugs are insufficient in efficacy or are discontinued due to harmful side effects or due to financial considerations. H2 may also be useful for patients with early RA, in whom antibodies against cyclic citrullinated peptides (ACPAs) are below standard values. ACPAs are positive in about two-thirds of patients with RA and are associated with rapid joint destruction and a poor prognosis [26, 27]. Patients at high risk are targeted for early aggressive immunosuppressive therapy. We therefore expected that the introduction of H2 into ACPA-negative patients with recent-onset RA may help rule out transient or non-aggressive RA. And, no urine sample; DAS28, disease activity score in 28 joints; ACPA, antibodies against cyclic citrullinated peptides. Clinical response was measured by changes in the disease activity score in 28 joints, using C-reactive protein levels (DAS28). Remission (DAS28 < 2.3) and the decrease in the DAS28 was evaluated as good, moderate, or a non-response according to the European League against Rheumatism (EULAR) response criteria. The DAS28 was evaluated at baseline, after 4 weeks of drinking high H2 water, at 8 weeks after the wash-out period, and at 12 weeks after another 4 weeks of drinking the water. a Concentration of H 2 in the water at each time point.The concentrations were measured immediately after preparation, and at 1 and 2 h after preparation. The error bars represent the mean and standard deviation (SD) for 5 independent measurements. b Concentration of H2 in the water with 1.6 ppm H2 (circle) or with 5 ppm H2 (square) at each time point. The concentrations were measured before drinking and every 5 minutes after drinking. The error bars represent the mean and standard deviation (SD) for 3 independent measurements. 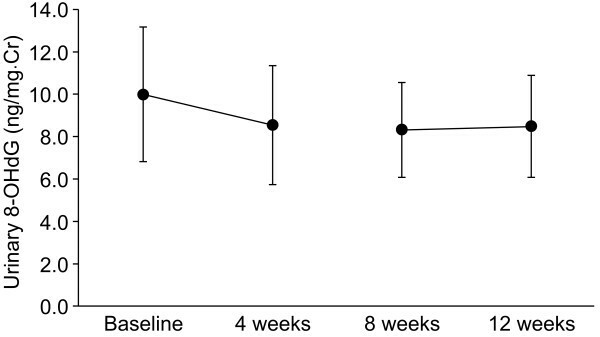 Urinary 8-OHdG in 18 patients measured at baseline and at 4, 8 and 12 weeks.Error bars represent the mean and standard deviation (SD) for measurements in 18 patients. DAS28 scores at baseline, and 4, 8 and 12 weeks.Error bars represent the mean and standard deviation (SD) for measurements in 20 patients. Many studies have demonstrated that ROS play some noteworthy roles in the pathogenesis of RA, and consequently, they have become therapeutic targets in this condition. The ROS scavenger superoxide dismutase (SOD) was expected to have clinical efficacy, and initially, bovine SOD was injected into the joints of patients with RA . However, in relation to the exogenous SOD protein, results from clinical trials have not been reproduced. Simulators of SOD, which have been shown to have considerable anti-inflammatory effects in animal models of arthritis, are still being investigated [33, 34]. Edaravone, which is approved for the treatment of acute ischemic stroke, is another ROS scavenger . A clinical report describes treatment of a patient with RA and ischemic stroke with edaravone, and raises the possibility of further clinical trials , but the results do not establish whether ROS scavengers are efficient in reducing the disease activity in patients with RA. Direct evidence is also lacking about whether ROS prime the autoimmune response or reduce chronic inflammation in RA. It has been demonstrated that molecular hydrogen ameliorates inflammation by down-regulating TNF-α [20, 37]. It is known that ROS including hydroxyl radicals function as second messengers for the production of TNF-α [38, 39]. There is a possibility that the anti-inflammatory properties by H2 may be through inhibition of the TNF-α pathway. It has been reported that hydrogen-rich saline prevented neointima formation by suppressing the NF-kB and TNF-α cascade which is involved in the redox-sensitive mechanisms in immune system . The reduction of 8-OHdG and the disease activity in RA patients presented here could be the results of downregulation of TNF-α pathway through scavenging hydroxyl radicals which occur upstream of the inflammatory cascade. It should be noted that the influence of H2 on the disease activities and oxidative stress was sustained even during the wash-out period. These continuous anti-inflammatory effects of H2 are observed with both the ACPA-negative and the ACPA-positive patients who were treated with immunosuppressive medications. The marker for oxidative stress, 8-hydroxyguanine is highly mutagenic because it pairs with adenine as well as cytosine. These properties cause partial phenotypic suppression during transcription as well as transversion mutations during DNA replication . It is likely that the error proteins, produced as a result of the altered genetic information, therefore, are identified as foreign molecules and play a role as neo-epitopes [42, 43]. They would then continue to activate the immune system. The sustained effects of H2 during the wash out period may reflect the decrease of such neo-epitope. On the other hand, there was no significant decrease of DAS28 during the washout period. It may indicate that the pathogenesis of RA did not disappear completely at the end of the first drinking period. It is necessary to investigate the transition of pro-inflammatory cytokines including TNF-α, both during the drinking period and wash out period for further studies. The prognosis of RA has improved during this decade, and a so-called paradigm shift has been achieved using early aggressive therapy to biologically modify the disease [44, 45]. Remission is not difficult to achieve; however, it is difficult to determine the role of drugs in remission . It is difficult to determine at which stage patients will be able to discontinue medication without recurrence of inflammation, and sustained medication is often necessary. Most of these problems are attributed to the intense immunosuppressive procedures, and the epitopes involved are still unknown. Patients with RA are classified according to their prognosis, as having progressive RA, which requires early aggressive disease-modifying biologic therapy, or as having transient RA, which may show spontaneous remission. It is difficult to distinguish transient from progressive RA in the early stages . In total 47.4% of patients (9/19) achieved the remission, except for one patient who had been in remission at the baseline assessment. Although the efficacy of H2 presented here is not inferior to those in recently reported studies on tocilizumab , adalimumab plus MTX  or MTX monotherapy  , the study here is non-controlled, on a smaller scale and also, the patient background and the period of medication varied. Estimation of the efficacy of high H2 water in RA patients should be done carefully in a further placebo-controlled study. The high H2 water was produced in a bottle by using a novel high-pressure method. Since molecular hydrogen is a very small molecule and is easily lost even through the wall of PET bottles with the passage of time, the patients had to prepare it themselves every day. Also, H2 is an inert gas having no taste or smell. It was difficult to set up placebo controls using another inert gas and a similar preparation. However, it is important to include placebo controls in future studies. TI designed the study and estimated all of the data. Also, he formulated and tested the hypotheses and derived conclusions. BS, TS, and RK developed and prepared the materials for high H2 water. They also collected the data for the concentration of H2 in the water and breath. MR showed patients how to prepare the high H2 water and collected data. YH, YN, and HH supported this study by offering space, collecting data, and giving advice. T. Nagao helped in designing this study and gave advice on many aspects. All authors read and approved the final manuscript.